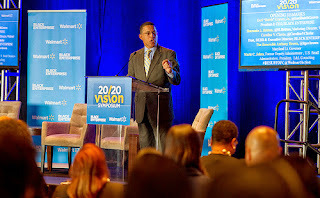 Black Enterprise, a wealth building resource for African Americans, and Walmart, the world's largest retailer, will guide hundreds of entrepreneurs and aspiring business owners as they gather at the 2014 20/20 Vision Forum. The 20/20 Vision Forum: Supplier Diversity in the 21st Century is a platform where entrepreneurs will be able to explore how to prepare themselves and their ventures to form profitable partnerships with large corporations as part of their supply chain. The forum was created by Black Enterprise jointly with Walmart to educate, encourage and empower audience members to become full participants in wealth creation within the global community. The event will be held at the Westin Peachtree Plaza in Atlanta, Georgia on Wednesday, October 1, 2014.